Being back home in Coleraine less than 48 hours after his sensational Rowing World Cup triumph set the seal on a perfect long weekend for Alan Campbell. 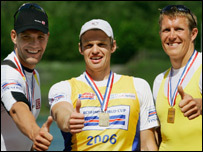 Single sculler Campbell claimed a surprise victory in the opening World Cup regatta in Munich on Saturday. Campbell took victory ahead of ex-world champion Marcel Hacker in his senior debut in the event while Olympic champion Olaf Tufte was only fourth. 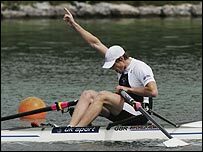 It was a performance which marked out the 23-year-old as a genuine medal contender for the 2008 Olympics in Beijing and Campbell is also excited about the prospect of competing on home water when the games roll into London in 2012. Campbell was greeted as the returning hero by some old friends and young aspiring rowers at Bann Rowing Club on Monday morning. Present were many people who had helped him in his younger days and he felt that he had to acknowledge the crucial part they had played in his success. "I love the people here and I feel that Coleraine really has something special about it and I'm not just saying that to please a few fellows in the boat club," Campbell told BBC Sport. "I used to go out (on that water) in just a little singlet. Now, I'd have the extra three or four layers on but we were brought up from an early age here to win." Campbell remembered his Coleraine Inst coach Bobby Platt bringing him all the way down to Cork seven years ago for the Irish Championships. "He had a lot of faith in me. He said:'We'll have a go and try and win it'. "It was a big event for me but I won it and it was a turning point and convinced me that this was what I wanted to do." London-based Campbell's life now means 11 months of intensive training a year. "It's seven days a week, three sessions a day. I get up at 6.15am every morning and drive 45 minutes to get to get to the best water. "We do the first session, then have breakfast and then get ready for another session. "We're constantly getting told:'That piece wasn't quick enough, you've got to go harder', so you have to push yourself." Coach Bill Barry is the man who drives Campbell on and while the workload means a curtailed social life, the Northern Ireland man says he's happy to make the sacrifice. "You've got to go against the grain a little bit and if you want to win, you've got to be a little bit crazy." Five-times Olympic gold medallist Sir Steve Redgrave was hugely impressed by Campbell's weekend performance in Munich and the Coleraine man was flattered by the great man's words of praise. "It means so much to me when a legend says nice things about me." However, there's little doubt that Campbell is something of a pioneer in the sport in Britain as traditionally the country hasn't made that many waves in sculling - in contrast to sweep rowing. Last year, Campbell was part of a quad sculls crew that managed to win a medal in Lucerne which was a major breakthrough for Britain. Stroke man Matthew Langridge's switch to the British eight for this year enabled Campbell to opt for the individual event with Matthew Wells and Stephen Rowbotham able to compete in the double sculls. "I'd won the trials for the second year running and they gave me the option to do the single but I'd already made it clear that I wanted to do it." Saturday's win put Campbell on top of the World Cup standings with the two other counting regattas to follow in Poznan and Lucerne. However, Campbell's main target this season will be the World Championships which will be held at the 2012 Olympics venue in Eton. "It's exciting times and I'm looking forward to the competition," adds Campbell. With Campbell's former school-mate Richard Archibald also making waves on the world scene with Ireland's lightweight four and Richard Chambers and Stephen Feeney in the British under-23 squad, there certainly seems to be something in the Coleraine water.